Restaurant closures in the health space have been rampant: In February, My Fit Foods closed all of its stores, and LYFE Kitchen and Native Foods Cafe also shuttered units in the past year. Operators like Louis Basile—founder of fast casual Wildflower Bread Company—that are looking to deliver more variety to the increasing demand for more healthy options are running into a conundrum. There's a difference between the talk and the actual order, Basile says. Veggie dishes have seen more growth than any other entree over the last year, according to Technomic's MenuMonitor. But the disconnect between consumer demand and reality is proving challenging for operators. 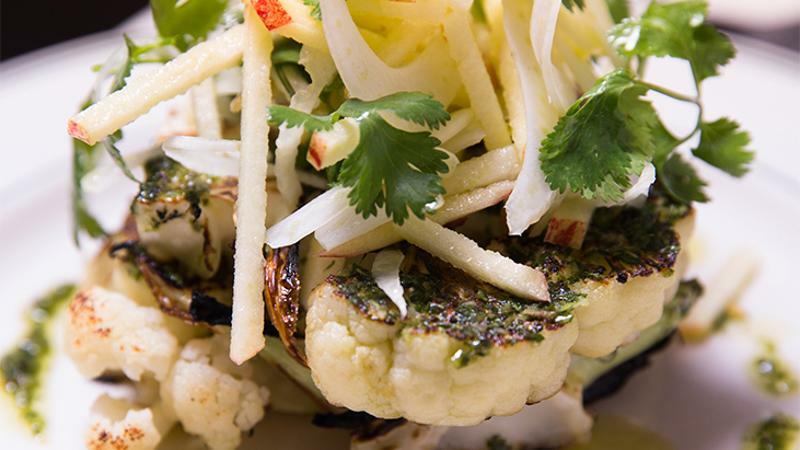 Wildflower Bread Company initially put cauliflower steak on the menu in early 2016. But after lackluster sales, it was yanked at the end of the year. Pricing was a problem. Wildflower raised menu prices at its 14 Arizona locations when the state increased its minimum wage. Customers are less adventurous as price goes up. They’ve got their go-to items; it's hard to break people out of their habits, Basile says. Labor and prep can also be issues. For example, Joe's Seafood, Prime Steak & Stone Crab's now-defunct Beet Wellington, a take on the classic beef version, took hours to make. And only one or two sold each day, according to Executive Chef Justin Diglia. As senior VP of culinary innovation for California Pizza Kitchen, Brian Sullivan has seen the same reluctance toward veggie mains. To entice veg-curious diners to order its new spicy Buffalo cauliflower small plate, the chain launched its Menu Adventure Guarantee. The promo, which applies to new menu items, guarantees guests another offering for free if they aren't satisfied with a new dish. This guide extends to a new single-vegetable entree the chain is ideating for a fall rollout. The challenge is coming up with a dish that has broad appeal and that can be marketed in a way that has credibility as a main plate, Sullivan says. The trick, he says, is making a vegetable that is filling enough as an entree and comes off as a good value next to meat. Credibility was a factor for Joe's when conceiving its cauliflower steak. As a steak restaurant, it wanted to give the option of a play on steak, so guests feel comfortable eating it next to someone eating a filet, says Diglia. The chain sells about three a day—a success, he says. It's not a big number; but ingredients are inexpensive, it's accessible year-round, it's quick to break down and there is no waste, as florets are used elsewhere. Plus, it helped win over vegetarian guests, he adds. Wildflowe's customers are still asking for more vegetable preps. But following the performance of its cauliflower steak, instead of betting on mains, the chain is testing mix-and-match veggie sides, marketed to make an entree. Wildflower isn’t counting out single-veggie entrees in the future, either. l'm confident it’ll come back, says Basile. “I think it's still ahead of its time.